Can't find your style? Knowing what you don't know. Will a ‘growth’ or ‘value’ regime dominate in equity markets from here? After ten years of ‘growth’ leadership, the debate around style timing is intense. Following the financial crisis, ‘growth’ stocks have clearly been a better option than ‘value’ stocks. The main explanations offered for this is lacklustre global economic and earnings growth, as well as suppressed interest rates. This is in stark contrast to the previous period after the burst of the tech bubble until 2007, when value outperformed. During that period, global economies were strong and growth easier to find, and focus tilted more to finding the cheaper stocks. The long term relative performance of the MSCI World Growth and Value Indices are shown in the chart below. Fortunately at Alphinity we don’t have to make this ‘top down’ decision - our investment process leads us into stocks with earnings leadership, allowing the portfolio to organically adapt to the right market regime. We see more consistent alpha delivered through investing with an unconstrained approach, where portfolio risk is concentrated at the stock level through a strong fundamental stock picking process. Our approach is about taking high conviction, idiosyncratic risk, and actively managing other risks where our investment process has no edge. There are always strong arguments from brokers and investors looking to forecast which market regime will dominate. It’s potentially a big decision, likely to dominate the future performance of a portfolio, and so there is a strong temptation by asset allocators and portfolio managers to pick this from a top down perspective. As always, hindsight makes surprises vanish and it’s clear what style your portfolio should have been tilted to. This debate has become even more intense recently given the ease with which these views can now be expressed through cheap ETFs, which offer exposure to different styles and factors. Great if you can get the timing right, but it’s a challenging proposition. These style shifts are generally associated with macroeconomic and geopolitical changes which are often abrupt and notoriously difficult to predict - no more so than at the moment. There have been significant surprises associated with Brexit, Trump and European elections; not to mention the recent unexpected weakness in inflation and the US Dollar. The outlook seems as fluid as ever with significant potential changes in growth, rates and inflation, not to mention geopolitics. These kinds of big ‘top down’ calls also risk straying into areas where your investment process has no ‘edge’. When discussing styles, it’s also easy to forget that you are still talking about real, underlying stocks. Taking a closer look at the composition of these two MSCI indices reveals the major decision you currently make, when choosing between growth and value: do you believe more in financial or technology stocks from here? Technology stocks currently constitute 26% of the Growth Index, but just 7% of the Value Index. In contrast financials have more or less the opposite position – a dominant 30% of the Value Index, but just 6% of the Growth Index. Under Alphinity's investment process, which looks for undervalued earnings upgrades, we see arguments for both sectors. Driven by both cyclical and structural factors, many Technology company earnings continue to surprise on the upside. There is a robust debate to be had on some stock valuations in the sector, but we still find pockets of value. Meanwhile, Financials turned a corner on earnings a year ago, as global growth and bond yields bottomed. Capital returns to shareholders are accelerating and there is significant optionality around further regulatory reforms. The strength of the turn-around is still potentially underestimated and valuations don’t appear stretched. Source: Alphinity Global (Rolling three-month earnings revisions for current year). In fact both sectors are part of the leadership in the current global earnings cycle, which started in 2016. This is shown in their relative earnings momentum above - over the last year both sectors have consistently seen stronger earnings upgrades than the overall global equity market (scores well above 50%). Predictably price leadership has also followed, with both sectors up ~27% over twelve months, compared to MSCI World up 13% (as of 17 August). Following ten years of ‘growth’ leadership, the debate around style timing has intensified. This is a big decision that could dominate future portfolio performance. There are compelling arguments for both sides given the current global macro environment and earnings cycle; however applying our stock picking process, which is unconstrained from the ‘value/growth’ decision, currently leads us to high conviction stock ideas in both the Technology and Financial sectors. In global equity markets there are always enough stocks that fit a more balanced process – allowing us to avoid making lower probability ‘top down’ decisions such as ‘value vs growth’. The high consistency in performance of a more style agnostic approach is well illustrated above. Holding a portfolio of stocks with a mix of value, momentum and quality has been able to outperform global equity markets through many different regimes – be it value, growth, bull or bear markets. 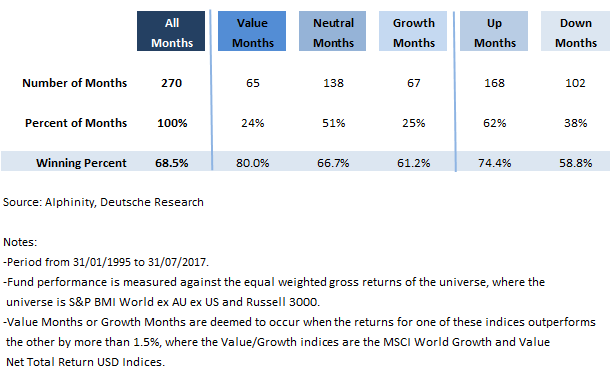 Since 1995, the approach has outperformed in 68% of months, ranging from 61% in ‘growth’ months, 67% in ‘neutral’ months, to 80% in ‘value’ months. It has also outperformed in both up and down markets. In an industry striving to conform to style or factor labels, we see more consistent performance from investing with an unconstrained bottom-up approach, allowing the portfolio to organically adapt to the right market regime. By Jonas Palmqvist and Jeff Thomson, Alphinity Global.